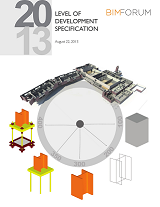 The Level of Development (LOD) Specification is a reference tool intended to improve the quality of communication among users of Building Information Models (BIMs) about the characteristics of elements in models. 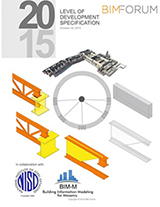 The LOD Specification expands upon the LOD schema developed by the American Institute of Architects (AIA) for its E202-2009 BIM and Digital Data Exhibit and updated for the AIA’s G202-2013 Project BIM Protocol Form by providing definitions and illustrations of BIM elements of different building systems at different stages of their development and use in the design and construction process. 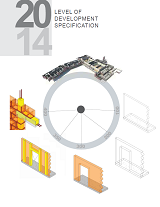 The 2014 version of the LOD Specification indicates changes to the 2013 version with a bold bar. Definitions have not been changed except for minor grammatical corrections and formatting. Images and image notes have been added in blue italics font.